You are here: Home / Coca-Cola Campaign / ColaLife pods? Another great day with a bunch of really creative people but more on the meeting in the next blog post. When the meeting finished I was able to arrange to tag along with Adrian Ristow to see more MDCs tomorrow and then I spent the rest of the afternoon preparing for that. And the image is the result! 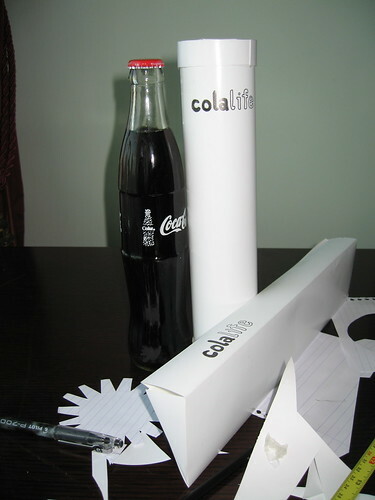 I’ve mocked up a couple of inserts: 1) one (the cylinder) is a coke bottle replacement and 2) is a ‘toblerone wedge’ (Jane’s idea) that should fit between the bottles. I want to see how the Coke distributors react when I put these in the crates. I’ll try and capture this reaction on video.